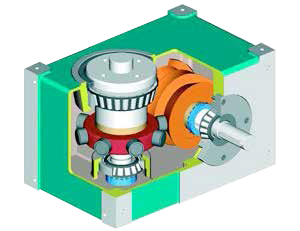 The Rotoblock® transforms the uniform rotary input motion into an intermittent rotary or oscillating movement of the output shaft. This is achieved through the action of a globoid cam and a set of roller engaged in the cam. The transformation of motion is precise, controlled and quiet. These features have prompted a growing number of companies to use the Rotoblock®. The Rotoblock® is an extremely simple device. A rotating globoid cam, properly profiled, creates a controlled movement of the probe (turret). The particular shape of the cam profile determines both the movement and the stop of the probe. The law and the time of movement of the probe can take an infinite number of combinations. the dwell angle: ensures the arrest, without games, of the probe. The magnitude of these angles can be selected in the draft stage. Normally the law of motion is symmetric and the cam can rotate in both directions. This will get the same kinematic characteristics and reversal of the direction of rotation of the probe.